Back Through Time is the third studio album by Alestorm. It was released on 3 June 2011 by Napalm Records and is the first Alestorm recording to feature Peter Alcorn on drums. 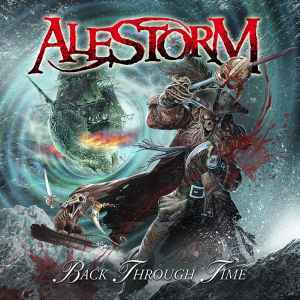 Back Through Time is the third full-length from “True Scottish Pirate Metal” band Alestorm. To absolutely nobody’s surprise, the pirate-obsessed band has decided to follow up their 2009 album Black Sails at Midnight with another serving of songs about booze, boats and brawling (and, um, time travel). Alestorm isn’t exactly breaking any new ground with Back Through Time. The band’s sound is essentially high-speed power metal with a hefty dose of folk metal elements and a bloody ton of pirate trappings. Now that Running Wild is no longer active (and even they seemed to outgrow the pirate fixation after a while), Alestorm has taken up the Jolly Roger for the next generation. Back Through Time does have a certain Running Wild vibe, but like Running Wild getting drunk with Flogging Molly. There are also traces of Elvenking and Mago de Oz. You have your power metal riffing and double bass drumming, but there’s also the accordion and violins and Christopher Bowes’ gruff, folksy vocals. It’s fun stuff, and even if you could care less about pirates drinking anthems like “Barrett’s Privateers” and “Rum” are pretty irresistible. The more straightforward metal songs like the title track and the nearly 8-minute “Death Throes of the Terrorsquid” are also impressive from a power metal point of view. The harsh, almost black metal vocals and symphonic elements on that last one make it sound almost worthy of Dimmu Borgir (or Stormlord, sticking with the seafaring theme). Is Back Through Time an essential or remotely original album? Of course it isn’t. Is it a hell of a lot of fun to listen to? Of course it is. Like Korpiklaani and Finntroll, Alestorm is one of those “go to” bands when you want an album to crank up, cut loose and raise a glass (or ten), and in that area Back Through Time does its job very well. See you at the bar, mateys! Edition Notes: The limited edition version of Back Through Time features two bonus tracks - covers of “I’m a Cider Drinker” (The Wurzels) and “You Are a Pirate” (Lazytown). Silver vinyl is limited to 100 copies.